Last week was a crazy week. I was so incredibly exhausted and stressed out I couldn’t see straight. For those of you that follow At Home with Vicki Bensinger you might recall that in October we had to put one of our Labrador Retrievers down because of nasal cancer. Well last Monday our other Lab started vomiting. At first I thought he got sick from something he ate in my moms backyard while visiting her. However, after 2 days of vomiting all he ate, I took him to the ER. They took an x-ray of his belly and said he had a blockage and to leave him overnight. Twelve hours later they would take another x-ray to see if it had moved. After the 12 hours the blockage was still there so we decided to have them do an endoscope to remove whatever was in his belly. I was so exhausted from being at the hospital late into the night and then couldn’t sleep once I got home. Wednesday I was zombie and basically felt like death. I desperately knew I needed something healthy to pick me up and make me feel alive again! The quickest thing I could think of was a smoothie. I looked in my refrigerator and saw a container of fresh spinach . Since spinach never let Popeye down I knew that would be my first ingredient for a large dose of Iron. With fresh mangoes, apples, grapes, and an avocado in the refrigerator and a bunch of bananas on the counter I decided my smoothie would be packed with enough nutrients to give me a massive boost for the day. While adding my ingredients I noticed after cutting into my avocado that it wasn’t good so I scrapped that, but used everything else. 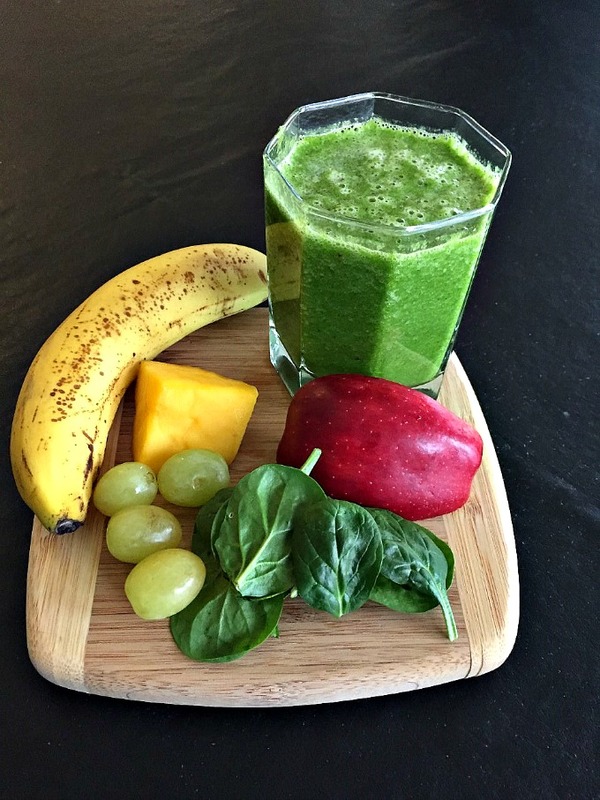 After I drank an 8 ounce glass of what I call my Green Tropic Smoothie I could almost immediately feel the results – it was astonishing!!! 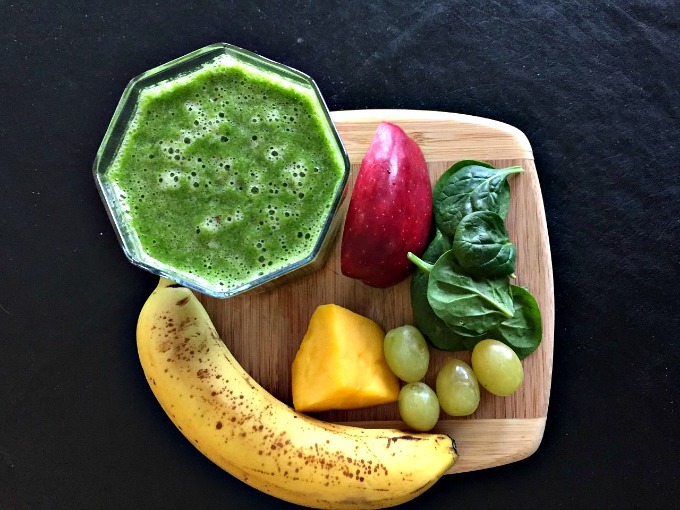 If you’re feeling sluggish and stressed try creating my green smoothie or rummage through your refrigerator to find healthy and flavorful ingredients filled with nutrients that you love. 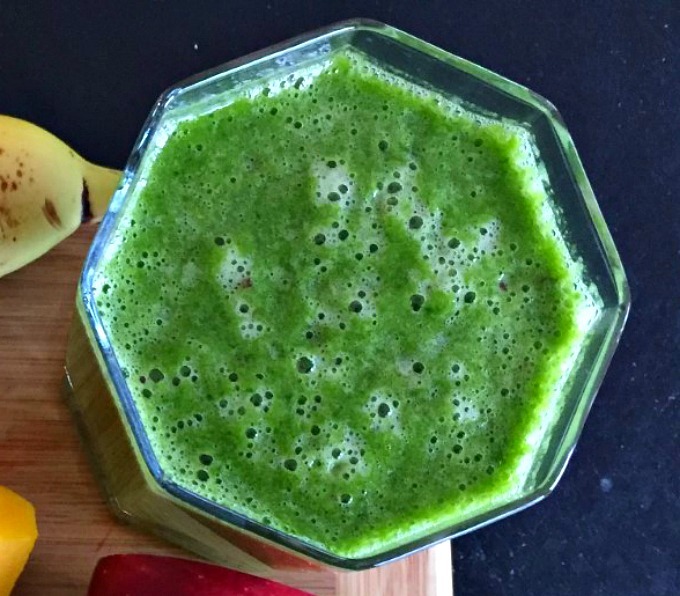 Whip them together in a blender and you’ll get a boost of energy. Be sure to add something green and enough of it – then by adding fruit it will naturally sweeten it up for a luscious treat. 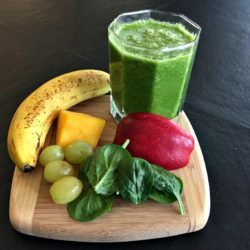 Get a jump start on your day with this refreshing, heart-healthy, nutirient rich flavorful smoothie packed with iron. 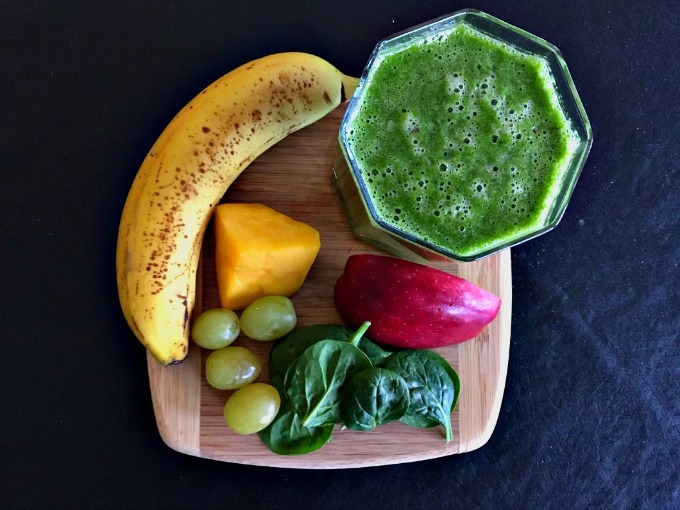 Add all ingredients to a blender starting with the fresh spinach. Hungry for More Savor these! Sorry to hear about your dog! It’s so hard when animals get sick, isn’t it? We can’t explain to them what’s wrong, and what we’re doing to make it right. This sounds like a difficult challenge for you — best of luck. Oh, and such a nice recipe. Thanks! Tell me about it. To top it off I’m suppose to get him neutered on Monday at almost 9 years old because his prostate is slightly enlarged and they believe it’s causing blood in his urine. This all seemed to occur right after he lost his brother. I can’t help but think this is stress related. He’s never had any issues and then this vomiting. He’s almost 9 years old. I find it hard to believe he didn’t just eat something bad. His stomach can take just about anything until recently. I’m hoping to just treat him with a good diet that I prepare rather than putting him on steroids. How did they discover Lambeau had it? I also wonder if he’s not just under stress since he lost his brother. I love skinny smoothie like this! YUM!